So I am looking for a car. Because I lease every so many years, invariably I find myself back at a dealership, wondering why I am doing this once again, but here I was in the office, waiting for the guy to come back from talking to his manager. Same drill. This is the dance. Speaking of drills, I used to think that the worst office to be stuck in is a dentist’s, but it isn’t, not by a long shot. Unquestionably it is the car salesman’s. I hate sitting there. Waiting. And this year I actually checked into several different brands and drove many vehicles rather than make my traditional sojourn to Honda. At the Honda place we know one another, and for some reason that gives a different feel to the dance. Wait… do you think they know this? And so today, while I’m waiting for the salesman to return to the office where he isn’t ‘going to put any pressure on me,’ my attention turns to his computer screen. Now before you accuse me of snooping, you need to know that the screen was facing me. That’s right. The screen was staring at me before I ever looked back. It was practically begging me to read! What you see in the photo above is as much as I could desperately type into my phone before the guy and his manager returned. 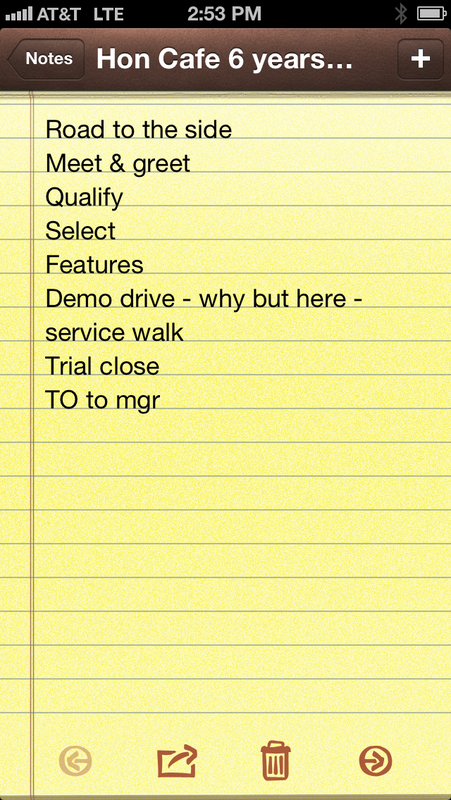 There is more to the list (it ends with something like ‘Close Deal’), but my fingers could only type so fast. The sales guy had been taking me down each item on the list! Seriously? Are you kidding me? I thought you cared! That I was the only person who mattered to you! That if I were the only sale you made it would all be worth it. Hey, I know it is part of the dance. But I don’t want to see the steps written on your hand! At least make it appear that you actually wanted to tango (now I know how my poor, bored-to-tears prom dates felt). Hey friends, just for a moment, consider the Father. From the throne He declares, Fear not, for I have redeemed you; I have called you by name, you are mine (Isaiah 43:1b). Is this possible? Could it really be so personal? No dance steps? No list? No agenda? No qualifications or conditions? “What you see in the photo above is as much as I could desperately type into my phone before the guy and his manager returned.” Amateur. Haven’t you watched enough spy shows? Next time take a photo with your iPhone. I just wanted to express how much it means to me that someone among the clergy “gets it”. I haven’t crossed the threshold of a church in many years because it felt rather like a disconnected and disingenuous sales job… all that mattered was that I contributed my money and my talent to the “show” that kept those congregations fat and healthy. You are currently reading The Dance at unfinished1.